Vivid, passionate and compelling, Wild Dogs Under My Skirt is also alive with humour and sheer energy. The raw and lyrical performance poetry challenges your perceptions of culture, life and love. 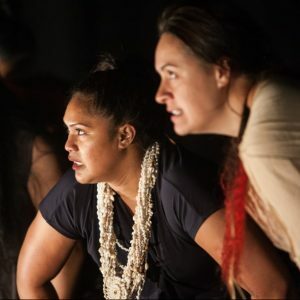 Breathing provocative new life into Avia’s exploration and celebration of what it is to be a Samoan woman, Polata’ivao introduces the nuance, power and dramatic sophistication, which earned her Best Director in the 2016 Auckland Theatre Awards. She also won Best Actress in the 2018 Wellington Theatre Awards and the show won Best Production of the Year. The six powerful Pasifika actresses portray a deeply personal view of life as Pacific Island women – and the sometimes uneasy collisions with the Kiwi way. Heart-stopping and unmissable theatre. Recommended for ages 13+. Strong language and references to violence.